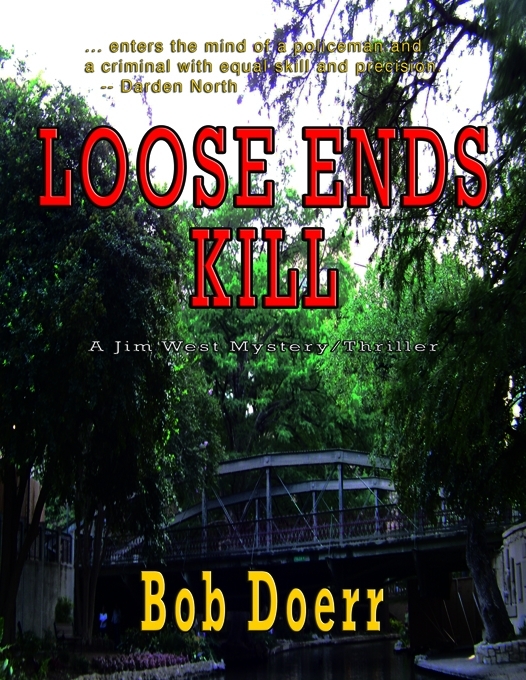 LOOSE ENDS KILL is a fast paced mystery/thriller that takes place in the historic city of San Antonio, Texas, and throws Jim West into the middle of a police investigation of the murder of an old friend’s wife. The police already believe they have the killer in custody – West’s friend. West is drawn into this mystery by a call from the old friend who requests his assistance. West agrees to help his friend and digs deep to try to find another suspect. In the process he soon discovers that he is being followed and targeted for harassment, but by whom? West quickly discovers that he didn’t know his old friend’s wife as well as he thought. To his surprise, he learns that she has had a number of affairs dating back for more than a decade. In fact, while investigating the murder, he realizes that his friend and he may be the only two people unaware of her philandering behavior. Theorizing that one of her lovers could have had just as much motive as her husband, West starts turning over the rocks identifying one lover after another. In doing so, West unintentionally ignites an outbreak of more death and mayhem. The police and his friend’s lawyers want West to go back home. The police even threaten to arrest him. Soon, West believes the real killer wants him gone or dead. Deciding the only way to resolve the case before the outside pressures force him to leave, he sets a trap for the killer using himself as bait. However, he soon learns he may have only outsmarted himself.